Inklined: Start Reading Early. There are Books for Everyone. Start Reading Early. There are Books for Everyone. Good morning! This post is part of the Teen Read Week Blog Tour! Today we're talking about starting on books young. Ahem *indoctrination* ahem. I think that reading books by the ton as soon as possible is one of the best things you can encourage a child to do. My vocabulary had immensely benefited from books. Reading for school is easier for me. And I always have time left over on the reading section of my PSAT practice tests. All in all, books have given me a community, a dream, and a passion for words and characters. Now I encourage you to go encourage a child. One who might not have fallen in like with books yet. One who doesn't belong to a family of bookworms. One who is in danger of becoming afraid of squiggly black letters on white pages. Give them a book. Take them to a book store and give them a $20. If they're too young to read, read to them. I'll leave you with some book recommendations. Some general ones, and some more specific. I've read and loved many of the books on your list, especially The Lion, the Witch, and the Wardrobe :) Great post! It is a really wonderful book! Glad you liked it. I've only read a few of those, but some (specifically Patricia C. Wrede's Enchanted Forest Chronicles) were my favorites. Good post! Reading as a child is magical. If you liked the Enchanted Forest, have you read Ella Enchanted? They're both really good, based on kind of the same idea. 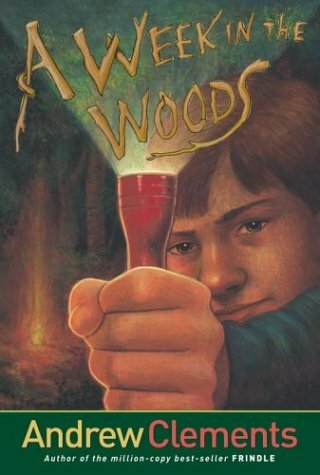 I'd like to point out that, really, anything by Andrew Clements totally fits your list :) I never read A Week in the Woods, but I read almost all his other books. He was my favorite author in elementary and middle school. This is very true. I had to pick just one, and A Week in the Woods is my favorite for boys, but I really love Things No Seen and my absolute fav. is School Story. It taught me a lot about publishing as a very young author. Teen Read Week Blog Tour Day!! !